In the chapter on population, we discussed how and why population growth exploded in the 20th century. Recall that as nations evolve from Stage 1 to Stage 2, death rates plummet, but birth rates are maintained at their existing levels causing an explosion in population. Europe and America were the first nations to enter Stage 2, but today no nation is in Stage 1. Most nations are still in Stage 2 and the result of this is the human population is now over 6.6 billion. Our numbers are expected to peak at 9 billion by 2100. A state (also called a nation or country) is an area with defined boundaries organized into a political unit and ruled by an established government that has control over its internal and foreign affairs. When a state has total control over its internal and foreign affairs, it is called a sovereign state. A location claimed by a sovereign state is called a territory. According to the United Nations, in 2012 the world had 193 nations; however, many of those nations dispute their borders. 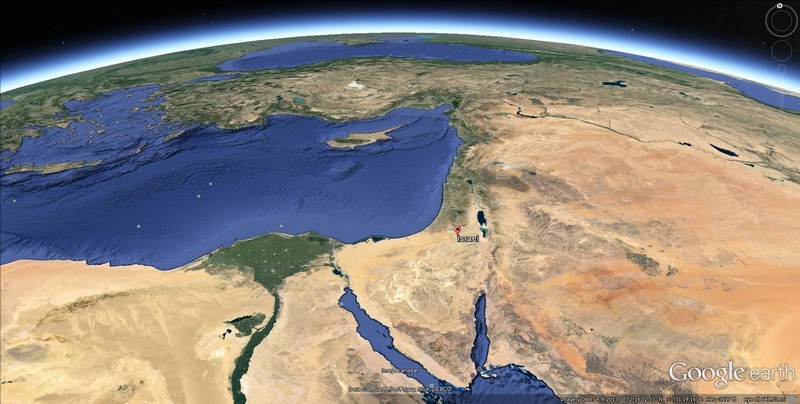 The idea or concept of a state originated in the Fertile Crescent between the Persian Gulf and Mediterranean Sea. The first ancient states that formed during this time were called city-states. A city-state is a sovereign state that encompasses a town and the surrounding landscape. Often, city-states secured the town by surrounding it with walls and farmlands were located outside of the city walls. Later, empires formed when several city-states were militarily controlled by a single city-state. A colony is a territory that is controlled by a sovereign state. European powers focused on establishing settlements and political power around the world by imposing their military, economic, political, and cultural influence through colonialism. Colonialism is control of previously uninhabited or sparsely inhabited land. Europeans used colonialism to promote political control over religion, extract natural resources, increase economic influence, and to expand political and military power. The European states first colonized the New World of the Americas, but later redirected their focus to Africa and Asia. This colonial expansion across the globe is called imperialism. Imperialism is the control of territory already occupied and organized by an indigenous society. Compact states have relatively equal distances from their center to any boundary, much like a circle. They are often regarded as efficient states. 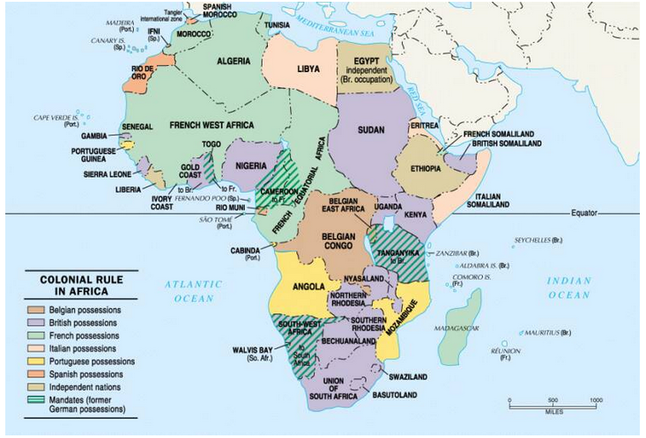 An example of a compact state would be Kenya, Rwanda, Uganda, and Burundi. Landlocked states lack a direct outlet to a major body of water such as a sea or ocean. This becomes problematic specifically for exporting trade and can hinder a state's economy. Landlocked states are mostly common in Africa, where the European powers divided up Africa into territories during the Berlin Conference of 1884. After these African territories gained their independence and broke into sovereign states, many became landlocked from the surrounding ocean. An example here would be the Austria. 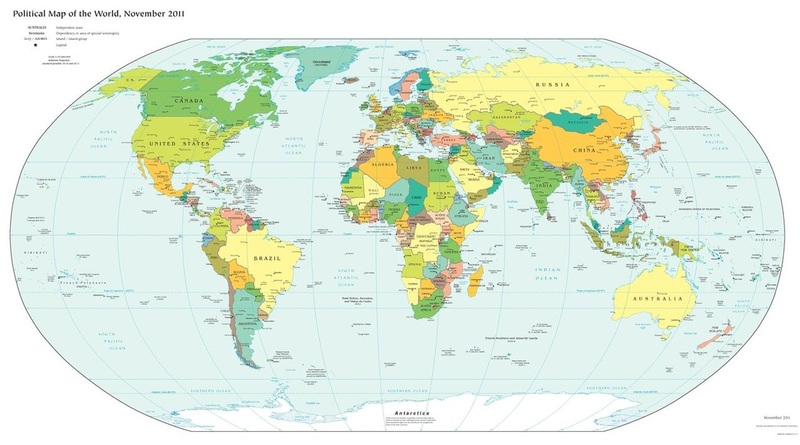 State boundaries are determined either by physical features such as rivers, mountains, deserts, or glaciers or by cultural features such as religion, culture, or ethnicity. Boundaries are actually dynamic features that vary with space and time. Throughout most of human history, boundaries were determined by frontiers where no political entity controlled the area. These were often large, uninhabitable regions such as deserts, oceans, and glaciers. But technological and communication advancements have allowed nations to protect there regions without the need of frontiers. Today, most frontiers have been replaced by boundaries. Desert boundaries can be quite large barriers for states and can serve for protection. Deserts are common along 30 degrees north or south of the equator where permanent high pressure creates sunny, dry conditions year-round. Cultural boundaries are used to separate people with differences in both of these cultural traits. Often times, cultural and ethnic conflicts occur between people with different languages or religions. Religious differences often coincide with boundaries between states, but in only a few cases has religion been used to select the actual boundary line. The most notable example was in South Asia, when the British partitioned India into two states on the basis of religion. The predominantly Muslim portions were allocated to Pakistan, whereas the predominantly Hindu portions became the independent state India. Language is an important cultural characteristic for drawing boundaries, especially in Europe. By global standards, European languages have substantial literacy traditions and formal rules of grammar and spelling. Language has long been a significant means of distinguishing distinctive nationalities in Europe. In 2011, the state of Sudan separated into Sudan and South Sudan along a language boundary. Most governments are placed into two categories: federal states or unitary states. Unitary states place most of the political power in the hands of a central government. The unitary state model works best with states that have little cultural or ethnic diversity and strong national unity. 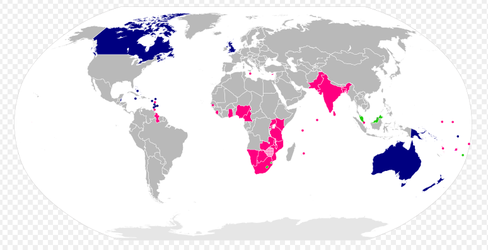 The United Kingdom is an example of a unitary state. Federal states – like the United States – works best with nations that have greater diversity. Size also determines if a government tends to be unitary or federal. Large states like the United States, Russia, or Canada tend to be federal because having the entire country controlled by one city (i.e. capital) becomes impractical. Many states around the world have been pressured to decentralize their governments and provide more political power to smaller ethnic groups. In the early twentieth century, international relations became a high priority as the world move from an isolationist point of view. The world had just experienced two world wars and the question of the day was, “Can the world survive a third world war?” Shortly after World War I, the United States first helped organize the first international peace organization called the League of Nations. The American Senate never ratified membership to the organization, which ultimately lead to its demise. 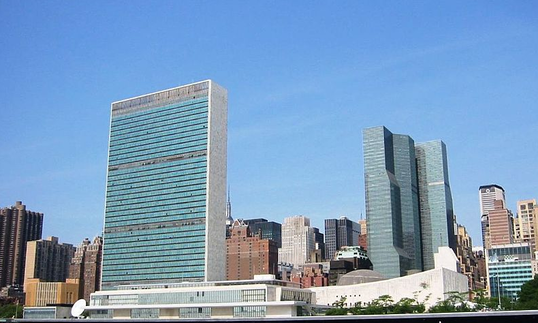 Following World War II, the United Nations was formed. 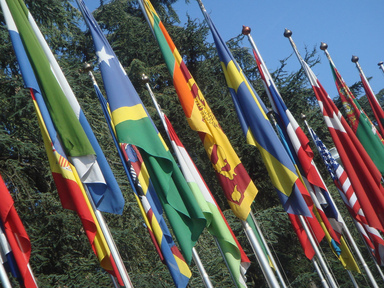 In 2014, the U.N. is comprised of 193 nations. (A list of members can be found here http://www.un.org/en/members/.) The sole purpose of the United Nations is to provide a forum for nations to state their grievances with other nations in a civil manner rather than through open warfare. One of the important documents that came from the United Nations is called the Declaration of Human Rights (http://www.un.org/en/documents/udhr/). Based on the United States Bill of Rights, this declaration declares what rights humans have throughout the world no matter what nation they are a citizen of. The most powerful council in the UN is the Security Council. The United States, the Russian Federation (formerly the Soviet Union), France, China, and the United Kingdom make up the permanent members of the council. Permanent members have veto powers for any Security Council resolution. Additionally, ten non-permanent members are elected for two-year terms. (http://www.un.org/en/sc/members/). This council has the power to determine if peacekeeping or military intervention by the United Nations is necessary. Often, these nations have differences of opinion and philosophies on various security and human rights issues. Thus, there is often conflict about what should be done. Three recent examples of such disagreements are Iraq, Darfur in Sudan, and Syria. In 2003, the United States and United Kingdom’s international military took action against Iraq because of concern of “weapons of mass destruction.” The other permanent members of the Security Council – Russia, France, and China – disagreed with this action, thus the United States and United Kingdom invaded Iraq with very little international support. Another recent conflict pitting the United States against the other Security Council members was the conflict in Darfur, Sudan. Former Secretary of State Colin Powell declared that the conflict in the eastern Sudan region amounted to genocide which under United Nations rules requires military, political, and economic action. However, again Russia and China disagreed with the United States and vetoed any military action in Sudan. Currently, the Security Council is having problems coming together to decide what to do with the human rights abuses and mass murders of citizens in Syria. After the dissolution of the Soviet Union in 1991, the world made a dramatic shift from military power to economic power. Today, the world's economic superpowers are the United States, China, the European Union (the largest economic entity in the world), and Japan. The recent global recession of 2007 lasted several years and has shown the world that an economic ripple in one part of the world could cause the entire world to go into a recession. The United States is not immune from what happens to even small countries around the world because of globalization. For example, the Greek debt crisis, which began in 2009 had an impact both inside Greece and worldwide. Currently, Greece has the potential to economically collapse. A collapse of the Greek economy would cause turmoil for the European Union and could ultimately cause the United States to go into a deep recession. Russia has lost economic power since the fall of the Soviet Union. As the price of oil increases, Russia has begun to rebound economically. This rebound has provided vast amounts of money to rebuild their infrastructure, military, and economy and has thus dramatically improved their influence in the world. The term terrorist (Latin for “to frighten”) has become a mainstream term since the attacks of September 11, 2001, in New York, Virginia, and Pennsylvania. Terrorism is the systematic use of violence by a group in order to intimidate ordinary citizens as a way to coerce a government into granting the group’s demands. Violence is considered necessary by terrorists to bring widespread publicity to goals and grievances that they believe cannot be addressed through peaceful means. Belief in the cause is so strong that terrorists do not hesitate to strike in spite of knowing they will probably die in the act. State-sponsored terrorism exists when a state provides sanctuary for terrorists that are wanted by other countries; provides weapons, money, and intelligence to terrorist groups; or helps in planning a terrorist attack. The story of the conflict between Israel and Palestine goes back thousands of years and is rooted in religious and cultural differences. Today's modern conflict is more than just about religion; it's about water, natural resources, land use, infrastructure, and economic development. Many would argue that the state of Israel began after World War II, when the United Nations partitioned Palestine into Israeli and Palestinian states. Others, especially Jews, believe the story goes back further to early biblical times. They claim that they were given the land by god thousands of years ago. There is growing debate around the world about needs to be done to end the conflict between the people of Israel and Palestine. Basically there are three options: 1) create a "two-state solution" where basically the Israeli people keep most of Israel, but give the Palestinians the West Bank and possibly Gaza Strip, 2) integrate Palestinians into Israel and legal citizens which would make them the majority within Israel, 3) keep segregation between Israelis and Palestinians as it currently exists and be considered an apartheid by the global community.